Adapted from a blog post that first appeared on The Ocean Project. Woodland Park Zoo, along with our partners the Seattle Aquarium and Pacific Science Center are working together to build the Seattle Youth Climate Action Network (CAN). The goal of this project supported by The Ocean Project’s Innovative Solutions Grants+ is to train and support teen leaders, helping them create a campaign that encourages their peers to take measurable action on the issue of climate change. In collaboration with partner staff and community agencies and organization, we are beginning to build local support and enthusiasm for the project. Seattle Youth CAN is picking up momentum—we have had a handful of successful events and have already learned a lot about starting a local youth network. Our training model for this effort has included engaging teen participants in hands-on action; a full day of instruction on climate science, communication strategies and local examples of climate action; and a campaign design workshop for the leadership group. We began our training with an inspirational day of action. In collaboration with Forterra and Green Seattle Partnership, 30+ Seattle area teens planted over 200 trees and native plants along a high traffic bike path in North Seattle. The event was an energetic gathering, and participants enthusiastically planted trees to offset Woodland Park Zoo’s carbon emissions through the Evergreen Carbon Capture Program. 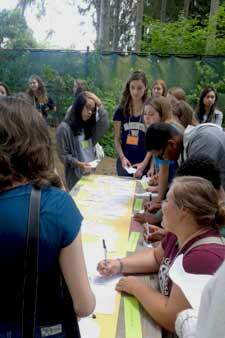 A month later, we brought 40+ teens from the three institutions to the zoo for leadership training on climate change science, communication strategies and action. To spark ideas for their own campaign, teens heard from local organizations and agencies and explored examples of climate action. Among the presenters was staff from Climate Solutions, Seattle City Light-Community Solar Program and Forterra. Each community partner shared their own work and pitched project ideas for how Seattle Youth CAN could partner with them. At the end of a full day of learning, participants shared which action campaign ideas they were interested in through a survey and small group discussions. 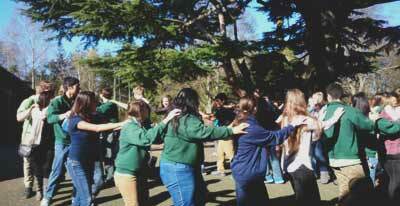 Teens left the workshop energized and ready to get Seattle Youth CAN off the ground. As the next step, a climate campaign design committee was formed with teen representatives from each institution. This committee met every other week to come up with a focus and plan for a summer action campaign. I facilitated this group process along with support from staff from our partner institutions. Rather than reinventing the wheel we used existing models for campaign design, and committee members participated in a workshop on behavior change from the zoo’s audience research staff experts. The committee hosted teens and staff from the Oregon Coast Aquarium’s Unplug for an OA campaign, and participated in a King County community forum to gather their input to help inform an updated Climate Action Plan for the County. After several months of research, planning and meetings, our campaign design committee chose to launch a transportation action campaign. Their research and interaction with city and county experts found that over 45% of Seattle’s carbon dioxide emissions comes from local transportation choices. The group felt that making smarter transportation choices would be something their peers could actually do to measurably reduce their carbon emissions. While they are still working out the details with the message and tactics, we know the teens will be inviting their peers to participate in a challenge to reduce their carbon footprint by increasing their use of public transit, biking, walking and carpooling. With the help of our evaluation staff, the group developed an evaluation plan using an online platform hosted by King County Metro’s Ride Share Online program to track participation in the challenge. At the start of the challenge, participants will complete a baseline survey to help the group measure behavior change for participating teens over the course of the month. In addition, we will be working with local transportation agencies and organizations to increase teen awareness of how to make smart transportation choices through events and activities. Teen leaders at each institution will promote the challenge with their peers and they hope to engage 100+ participants in action. Since our action event and full day workshop earlier in the year, we have continued to organize monthly Seattle Youth CAN events. These events are designed to enable other teens from the three institutions to get involved and deepen their understanding of Seattle Youth CAN and related climate change issues. 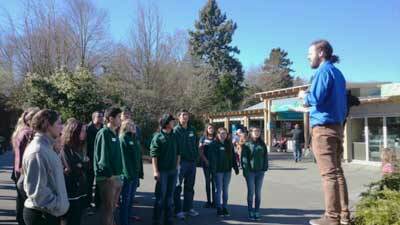 Recently, teens organized and hosted an event at Woodland Park Zoo, “The Impacts of Climate Change on Wildlife.” We had over 60 youth attend the full day event which included presentations from local climate scientists from NOAA and The University of Washington, as well as youth-led, climate-focused tours of the zoo and community building activities. More than half of the teens who attended were new to Seattle Youth CAN and we were excited to see the continued enthusiasm for our growing network. We’re feeling good about our progress and the identity we are building through the network, the trainings and events that have been well attended by our teens, and the support we have received from our partner institutions and community supporters. Our teen leaders and other members of the network are eager to finally launch the action campaign and be able to share with their institutions and peers how they plan to take action to reduce carbon emissions. Creating a structure for truly youth driven action and leadership, while also providing participants with enough resources and support is at the core of our program model. Our teens live busy and complex lives and creating a leadership opportunity with the right mix of structure and space is something we continue to work on. After many months of supporting the group in moving their planning forward, we are proud to announce that the challenge has officially launched! In September teens and staff will focus their efforts on planning for the Youth Climate Summit that we will host on October 10 at Woodland Park Zoo. At this event our campaign leadership group will have the opportunity to share the results of their transportation challenge with a large audience of peers. We also see this event as the opportunity to expand our network beyond the current three institutions and invite other Seattle area teens to join Seattle Youth CAN. I believe that with continued support, we can expand this network to be inclusive of all youth in our area who want to get involved in climate action. I am also hopeful that, as we refine our model, it will be something that can be shared and used by groups around the country looking to engage youth in collective action. Speak up for Washington’s Wild Future!